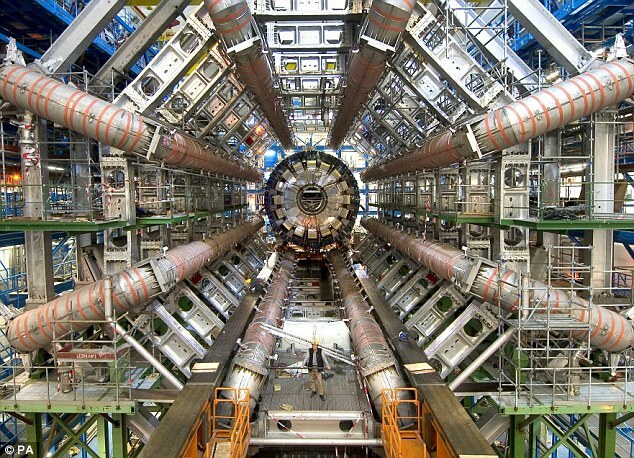 (CNN) -- Is the Large Hadron Collider being sabotaged from the future? Or merely by birds? The LHC, the world's largest particle accelerator, has been under repair for more than a year because of an electrical failure in September 2008. Now, excitement and mysticism are building again around the $10 billion machine as the European Organization for Nuclear Research (CERN) gears up to circulate a high-energy proton beam around the collider's 17-mile tunnel. The event should take place this month, said Steve Myers, CERN's Director for Accelerators and Technology. The collider made headlines last week when a bird apparently dropped a "bit of baguette" into the accelerator, making the machine shut down. The incident was similar in effect to a standard power cut, said spokeswoman Katie Yurkewicz. Had the machine been going, there would have been no damage, but beams would have been stopped until the machine could be cooled back down to operating temperatures, she said. As it begins to run at full energy, greater than any machine of its kind, the LHC will help scientists explore important questions about the universe. The ambitious project also has attracted its share of doubters. Some alarmists expressed fear last year that the accelerator could produce a black hole that might swallow the universe -- a theory that LHC physicists, including Myers, dismiss as science fiction. Another fringe theory holds that the LHC will never function properly because it is under "influence from the future," according to physicists Holger Bech Nielsen and Masao Ninomiya. They suggest in recent papers that no supercolliders that could produce the Higgs boson, an as-yet-unseen particle that would help answer fundamental questions about matter in the universe, will work because something in the future stops them. This also explains the "negative miracle" of Congress canceling the Superconducting Supercollider project in Texas in 1993, Nielsen wrote in a paper on arXiv.org, a site where math and science scholars post academic papers. "One could even almost say that we have a model for God," one who "hates the Higgs particles," Nielsen wrote. But bizarre ideas about the LHC -- and in particular the debunked black hole theory -- have gotten more people interested in the whole project, said Joseph Incandela, professor at the University of California, Santa Barbara. He will be in the position of deputy spokesperson for the CMS experiment, one of the two general-purpose experiments at the LHC, as of January. Although physicists such as Incandela have been working on the same questions and building accelerator experiments for decades, no one has paid much attention before now, he said. There were people who followed the topic, but not the broad audience that emerged in the past year or two, he said. "Maybe it's just captured people's imaginations," he said. "It's really a wonder of science and technology to build such a large accelerator, a 27km-long machine that works at the precision of a fraction of the diameter of your hair," he said. When push comes to shove, the name of the game is 'what is nature,' and we're not going to know until our experimental colleagues tell us,"
The results of the LHC experiments may help resolve fundamental problems such as the disconnect between Albert Einstein's theory of relativity, which describes the world on a large scale, and quantum mechanics, the laws of matter on a scale too small to see. The LHC, located underground on the border of Switzerland and France, passed a proton beam halfway around the circular tunnel Saturday, undeterred by the bird incident earlier in the week. The full-circle beam event scheduled to happen this month also took place last year on September 10 amid much celebration. But just nine days later, the operation was set back when one of the 25,000 joints that connect magnets in the LHC came loose, and the resulting current melted or burned some important components of the machine, Myers said. The faulty joint has a cross-section of a mere two-thirds of an inch by two-thirds of an inch. "There was certainly frustration and almost sorrow when we had the accident," he said. Now, "people are feeling a lot better because we know we've done so much work in the last year." Even physicists who are not on the ground at CERN, awaiting for news from the LHC abroad, haven't given up. Mark Wise, professor of physics at the California Institute of Technology, said he's just as excited about the results that will come out of the LHC as he was last year, and views the September 2008 accident as a delay rather than a devastating event. Wise noted that Tevatron, the collider at the Fermi National Accelerator Laboratory in Illinois, has also had its share of failures, but is generally considered to work just fine. "It's a horribly complicated piece of equipment, it's not like there's not going to be problems along the way," he said. "They will surmount those problems." LHC personnel have done a lot of testing of electrical connections to make sure the incident is not repeated under the same conditions, and it developed a new magnet protection system, Myers said. They have also put 900 pressure relief valves all around the machine so that if a similar problem does occur, the same kind of pressure build-up will not take place. Myers hopes to have particle beam collisions before Christmas, and then prepare the machine for higher-energy particle-smashing. 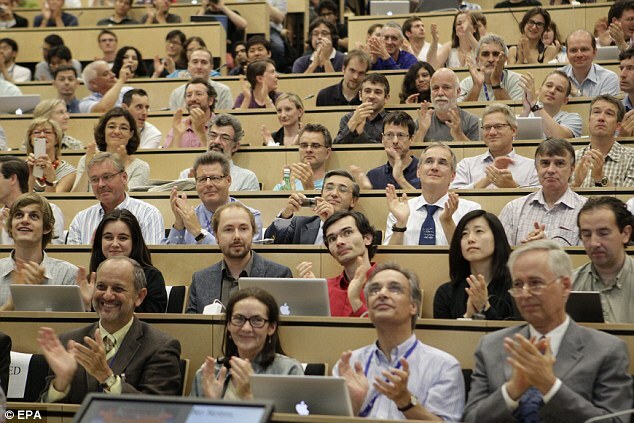 The full scientific program for the LHC will probably last more than 20 years, he said. But it won't be that long before scientists could potentially discover new properties of nature. The Higgs boson, also called "the God particle" in popular parlance, could emerge within two or three years, Myers said. Evidence of supersymmetry -- the idea that every particle has a "super partner" with similar properties in a quantum dimension (some physicists believe there are extra dimensions the world) -- could crop up as early as 2010. For some theoretical physicists such as Wise, finding the Higgs boson and verifying every prediction of the Standard Model of physics would be the worst outcome. He wants the LHC to deliver surprises, even if that means no Higgs. "When push comes to shove, the name of the game is 'what is nature,' and we're not going to know until our experimental colleagues tell us," Wise said. ATLAS and CMS are the general-purpose experiments designed to find the Higgs boson and other rare particles that have never been detected before. ALICE, another experiment, will explore the matter that existed some 10 microseconds after the Big Bang, said John Harris, professor of physics at Yale University and national coordinator of ALICE-USA. At that time, there was a "hot soup" of particles called quarks and gluons at a temperature of around 2 trillion degrees above absolute zero, he said. Although they have never been directly seen, these particles are theoretically the building blocks of the bigger particles -- protons, neutrons and electrons -- that form the universe as we know it. The "soup" is actually liquid that flows extremely fast, but will only be around for about 10-21 microseconds before it cools down and is itself miniscule, he said. Not everyone who works on LHC physics intended on becoming a scientist. Incandela thought he was going to be an artist, and studied chemistry because he was interested in glass sculpture. It happened that he was also good at math and physics and ended up going into that. Despite obvious differences, art and science -- even LHC-related physics -- do have some commonalities, Incandela said. "Both of them enrich the human existence beyond just the maintaining of health, wealth and welfare," he said. "They both have an idealism also associated with them, a timelessness." so what are we talking for a price with the top mounts? Well this is really depressing that no one has even bothered to post a one liner! What is the Large Hedrone collider (LHC), this is my layman understanding so far. We all know that different elements or materials in the periodic table are made up of individual spheres called atoms, that is, what early science discovered so far . Further experiments discovered that every atom reacted differently to experiments, did that mean that there were 80 different atoms? If so, what made them different? science subsequently discovered smaller object in the atoms. The first subatomic particle discovered was the electron and later, neutrons, protons. So the nuclei of an atom is made up of electrons, protons, neutrons. This is basic school level science we are all aware of. But then they discovered cosmic rays bombarding the earth from space, with unknown particles not made of electrons neutrons and protons, there were other mysterious particles, unknown to the scientific community, so they made the particle accelerator, to reproduce cosmic rays in a lab, since 1950s 80 particles have been discovered with different names (p.s. these 80 particles are not the elements on the periodic table). Thus from the early smaller particle accelerators scientist have further discovered that electrons neutron and protons are made of three particles called quarks. For the hundreds of materials in this world, the 80 particles that were discovered, you only need 12 fundamental particles out of them, divided into 3 families each family consisting of four particles made up of 2 quarks electron and electron neutrino. You only need 1 family of the 3 families to describe every thing around us. The other two particle families (out of the three families) are identical to the first family, but they are heavier! And no one knows why they are there and what their purpose is and why they are heavier, but only a theory of higgs boson (the god particle) to explain this. coming back to the Particle accelerators, which basically works on the principle E=MC^2. Which means mass and energy is inter-changeable. The equation states that it requires a lot of energy to create mass, ever since particles accelerators have been getting bigger and bigger and BIGGER, So they built the LHC particle accelerator, the biggest one. when particles are accelerated and collided with each other (yes just like atoms were collided to release energy and subsequently the discovery of the atomic bomb!) the energy released from this collision and then frozen produces new particles. Now, LHC experiment is extremely complex and honestly if you’re not a nuclear physicist you wouldn’t understand a thing just like me. So I’m going to skip that, and discuss who actually made this LHC possible. They didn’t just go out there and spend billions on a hypothetical theory that there is an elementary particle called the higgs boson that gives mass to every other particle and makes some atoms unique and is everywhere in this universe, basically the building block of mass. The higgs boson had no mathematical proof at the time it was theorised, the mathematical proof came later by six scientist: Abdus Salam (our Pakistani scientist), Sheldon Glasgow, Steven Weinberg, Richard Feynman, Freeman Dyson, Julian Schwinger. all receiving noble prizes in physics for unifying their theories to prove the existence of the higgs boson mathematically. Because of these scientists the LHC was built to recreate the moment just after the big bang to discover this higgs boson particle that created everything in this universe. But of course no one for sure knows what they are actually experimenting on, and for all we know they probably have already discovered the higgs boson, they could be harvesting new unknown mass particles and colliding them in the LHC to produce the biggest controlled bang! A new nuclear devise? The doomsday theorists are highly probable in the light of established facts based on human history, so 50 years from now we might unlock the truth of this universe and with that a whole new bank of data to create more deadly weapons. more theories please any one. LHC data will also help in accepting or discarding String Theory/M Theory. The most mysterious thing that String Theory states is prediction of extra dimensions in our universe (11 to be precise). We currently live in 4 dimensions (3 dimenions for space and 1 time), just try to imagine something that exists in 5th or 6th dimension and it will surely boggle you mind. Higgs boson (the particle) and evidence of Higgs field will surely open a new chapter of development and understanding of universe. If we some how harness the force of Gravity as we have done with Electromagnetism , we might be able to do things like time travel and teleportation. I have heard about the particles mysteriously disappearing, that is why the Higgs boson is so mysterious, please elaborate on this. Are we looking into the 5th dimension? Due to the particles mysteriously disappearing Scientists tend to believe that this Universe is a Hologram! I guess we are talking about vacuum fluctuation, in that case, particles do not simply disappear, but a pair of particle and anti particle is created spontanously which then annhilate each other. Through the great desert dunes, where the moon was full and white, through the great mountain pass, upto the fortress on the ridge that guarded the entrance to the other side. Well, String theory suggests that Gravitons work with extra dimensions (the appear and disappear from our dimensions to higher dimenions and come back) but these dimension are at sub atomic level only. What LHC would do is try to match the energy before and after the collision of protons wizzing very near to the speed of light, higher the velocity higher the mass, if there is a difference between the energies before and after the collision that means either energy has appeared from another dimension or has vanished to the other dimension. This would confirm higher dimensional theory and higgs boson. Mind you, extra dimensions do not just mean spatial dimensions they could very well be time dimensions. Well, String theory suggests that Gravitons work with extra dimensions (the appear and disappear from our dimensions to higher dimenions and come back) but these dimension are at sub atomic level only. This is a bit confusing, isn't gravity due to the curve of spacetime caused by the presence of a massive object, where does the graviton fits into all this? Yes you have actually understood the theory but, the explanation of your confusion is what is required for a complete standard model and the four fundamental interactions of forces. Black holes could be explained in the cosmos, but it cannot be explained in the standard model of elementary particles, hence the theory of gravitons, which is a particle. Different scientist come up with different theories, it's the unification and rejection of these different theories that would yield a result. Until then confusion is all we have. WASHINGTON (updated on: February 17, 2010, 09:51 PST): US physicists have created matter at around four trillion degrees Celsius, the hottest temperature ever reached in a laboratory, simulating a ‘quark soup’ scientists believe existed at the universe's birth. The Department of Energy lab where the record-breaking temperature was reached said the effect was achieved by slamming together gold ions traveling at nearly the speed of light inside the Brookhaven National Laboratory's Relativistic Heavy Ion Collider (RHIC) -- an "atom smasher" with a 2.4-mile (3.8-kilometer) circumference. The ultra-high temperature is higher than what is needed to melt protons and neutrons into a plasma of quarks and gluons, the substance that filled the universe a few microseconds after it came into existence 13.7 billion years ago, Brookhaven National Laboratory (BNL) said Monday. The plasma of four trillion degrees Celsius (7.2 trillion degrees Fahrenheit) -- 250,000 times hotter than the center of the sun -- existed for only a few microseconds after the birth of the universe. It quickly cooled and condensed to form the protons and neutrons that make up everything from individual atoms to stars, planets and people, Brookhaven explained on its website. The temperature of hot matter is measured by looking at the color, or energy distribution, of light emitted from it -- similar to the way one can tell that an iron rod is hot by looking at its glow. The properties of the matter produced at RHIC were determined using highly sophisticated detectors that looked at the particles the matter emitted during its very brief lifetime -- less than one billionth of one trillionth of a second. The US research program will be complemented by studies soon to get underway at the Large Hadron Collider (LHC), a 17-mile-circumference particle accelerator buried underground on the French-Swiss border near Geneva, the BNL said. "The LHC will devote a month each year to colliding heavy nuclei at energies much higher than RHIC's -- extending the exploration of matter one step farther back in time toward the birth of the universe," BNL said. hmm... i thought the closer u get to the speed of light the mass starts turning into energy.. and that once you reach the speed of life you do not have any mass left..
just WOW man.. i respect these people so much. they would spend BILLIONS of $$ to search for knowledge and learn more. and people scream in denial when i tell them matter/antimatter weapons are a realistic scenario. we need to jump start our research in theoretical and quantum physics.. start on on paper at least.. so what if we don't have money.. its never about the $$.. look at the GCC.. they got $$ but i doubt if they ever build any labs like that. hmm... i thought the closer u get to the speed of light the mass starts turning into energy.. and that once you reach the speed of life you do not have any mass left.. anyways. Pakistan should at least do something on papers, it will not take that much money, but alas, we are lazy people only good in talking, politics and creating fuss in the country. I think people like you, can make a difference, keep your hope alive. inshaALLAH brother. thank you for the warm words. GENEVA: Physicists at the CERN research centre achieved high-power collisions of sub-atomic particles on Tuesday in their attempt to create mini-versions of the Big Bang that led to the birth of the universe 13.7 billion years ago. 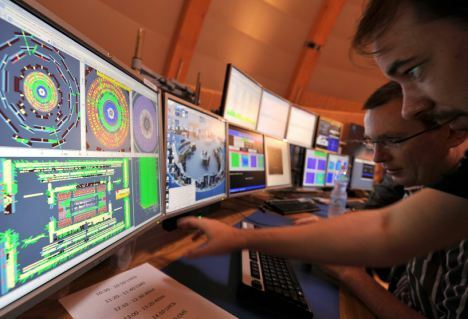 The experiment at the European Centre for Nuclear Research (CERN), creating a record for the energy of particle conditions, will allow researchers to examine the nature of matter and the origin of stars and planets. "This is a major breakthrough. We are going where nobody has been before. We have opened a new territory for physics," Oliver Buchmueller, one of the key figures on the 10 billion Swiss franc ($9.4 billion) project, told Reuters. The collisions took place at a record total collision energy of 7 billion billion electron volts (eV) and at a nano-fraction of a second slower than the speed of light in CERN's 27 km (16.8 mile) Large Hadron Collider (LHC), about a hundred metres (330 feet) below the Swiss-French border. The experiment was delayed for a few hours by a couple of technical glitches with the power supply and an over-sensitive magnet safety system. This led the physicists to suspend the mega-power particle collisions, the focus of the world's largest scientific experiment. After the problems arose as beams were injected into the collider in the early morning, CERN officials were quick to dismiss any suggestion that it was a repeat of a major incident in September 2008 that seriously damaged parts of the experiment and delayed the full launch of the project until now. During the coming months and years, CERN scientists expect the project to lift the veil on some of the mysteries of the cosmos -- how matter was converted to mass after the fireball of the Big Bang and what is the dark, or invisible, matter that makes up an estimated 25 percent of the universe. As rumours fly that physicists have discovered 'The God Particle', are we about to know the Mind of God? So are we about to know the mind of God, as Stephen Hawking once put it so memorably? Is physics – Big Physics – on the verge of answering the ultimate question of Life, the Universe and Everything? For if the rumours are true, a very significant announcement indeed is to be made tomorrow morning in Geneva, one that will mark the greatest breakthrough in science’s Senior Service for decades. For a week or two now the Internet has been alive with talk that the scientists at CERN, the European nuclear research institute in Switzerland, are about to announce that they have found the ‘God Particle’, aka the Higgs Boson, aka the particle that gives the Universe its mass and explains why the galaxies, the stars and planets and indeed we ourselves are as we are. CERN’s head of media relations, the inestimable and unflappable James Gillies, is staying tight-lipped about what will be announced at the Press Conference, but several things point to something very significant indeed. Firstly, that the announcement is being made, in Geneva, on the same day that a large particle physics conference begins in Australia. If CERN had something big to announce one might assume that they would do so in Melbourne where most of Big Physics will be decamped. But CERN has always insisted that if and when the Higgs is confirmed this will happen at the home of the Large Hadron Collider, the £3bn machine which found the thing. Secondly, scientists leak like a sieve and all those Internet rumours (posted on sites like Peter Woit’s blog not even wrong) will have come from somewhere. More than two thousand people work at CERN and particle physics is dominated not by shy and reclusive geeks but gossipy alpha humans. From what I hear there is a buzz in the air at CERN and a great deal of champagne is being put on ice. 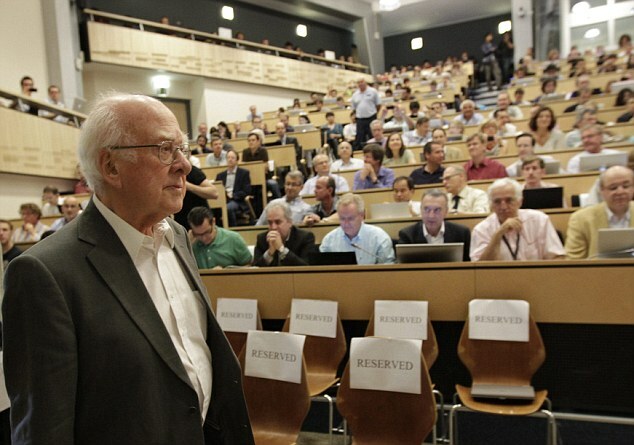 Then there is the fact that Peter Higgs himself is flying in to attend the seminar and press conference, as are a number of other high-level Higgs people. Prof. Higgs is 83 and presumably he wouldn’t be making the effort if the announcement was ‘sorry, nothing to report’. So what are they going to say and what will it mean? All the evidence is that CERN will say it has found something that looks very much like the Higgs particle, but they still have a few i’s to dot and t’s to cross before a formal ‘discovery’ can be announced in a peer-reviewed journal. There will be much talk about whether the findings come in at a ‘four sigma’ or ‘five sigma’ level. These are measures of statistical significance that in the latter case mean that it is 99.99997% certain that the result is not down to chance alone. Physics is, as you would imagine, a very precise science and does not make discoveries lightly. If these were psychologists, who demand a much lower level of proof, they would have announced the discovery of the Higgs before they had even turned the LHC on. But this will be, all the omens say, as near-as-dammit a discovery and the champagne will flow. The interesting bit is working out what it means and what comes next. Because the discovery of the Higgs is far from the end. It is not even the end of the beginning. The good news is that confirmation not only that the Higgs exists but that it is roughly the mass (125GeV) that everyone expected it to be will mean that the ‘standard model’ of physics, which describes the sub-atomic world, will not need to be torn up. Of course, as everyone at CERN has been stressing, confirmation that the Higgs does NOT exist would be just as exciting. This would mean the standard model is wrong and that physics needs to go back to the drawing board. After all, the discovery that the Earth orbits the Sun not vice versa as everyone thought, did not mean the end of Astronomy. But spinning a non-discovery into a scientific triumph would have been, politically, a hard sell. ‘You’ve given us £3bn to build a machine and now it has discovered that the particle it was designed to discover does not exist. We now need some more money to find out why.” You can imagine what the response to that would be. It is important to realise what discovering the Higgs will not tell us. The Higgs particle is the physical embodiment of the Higgs Field, which is a sort of ether-like entity that permeates the entire cosmos like a sort of invisible treacle. ‘Mass’ is the result of how a particle interacts with this field. Heavy particles, such as protons, wade heavily through the treacle. Lighter ones like electrons zip through, so streamlined that they hardly get bogged down at all. And photons, which have no mass, simply do not notice the Higgs Field. The Particle can be likened to the field interacting with itself. So does this explain why I weigh what I do and why a feather weighs what it does? No, not really. The Higgs Mechanism (the name given for this mass-giving process) only explains the ‘rest-mass’ of the fundamental particles themselves. A lot – in fact more than 99% - of your mass is actually derived from the energy that binds all your sub-atomic bits together (energy and mass, as Einstein said, are equivalent). The Higgs has been (mis)named the God particle. The ‘Holy Spirit’ particle would perhaps be more appropriate. We still will not know what ‘stuff’ really is. Big Physics is full of elephants in the room and one of these is the fundamental nature of matter. What are quarks, the building blocks of protons and neutrons, actually made of? ‘Quarkstuff’ doesn’t really cut it. All stuff is made of other stuff. The current best-guess is that particles are manifestations of ‘strings’, vibrating one-dimensional filaments of – well, ask a particle physicist, I think 'rolled up bits of spacetime' is the idea – that ‘vibrate’ at different frequencies endowing the particles with their properties. Other elephants include time, a deeply mysterious entity that no one really understands, the origin and fate of the Universe and indeed whether the Universe we see is firstly real, and secondly whether it is all there is. Particle physics is going through an interesting period, thanks in no small part to the LHC, after a third of a century in the doldrums. But Cosmology is, arguably, going through an even more exciting time, with talk of holographic universes (you and everything you see is an illusory projection of events that are taking place on a vastly huger scale at unimaginable distances and inconceivable dimensions). Respectable scientists talk of simulated universes, the possibility that our world is a computer game in someone else’s Universe. It is an astonishing fact that few serious cosmologists now believe that the stars and galaxies that we see are all there is; the vastly greater ensemble christened the Multiverse, which may be ‘multi’ in a number of different ways, is now more or less accepted as fact by most astronomers, including Lord Rees, the Astronomer Royal. And this is not the result of philosophical angel-pinhead choreography, but hard, cold data generated by our biggest telescopes on the ground and in space. Fundamentally, we still do not have a testable theory of quantum gravity, a theory that would unite the world of the atoms and electrons with Einstein's world of the galaxies and black holes. String theory is a good candidate, but it is not the only one, and I understand that to test it would require a new version of the LHC bigger than our planet. And there isn’t the money for that right now. It gets (even) more interesting. The ordinary matter that we see, the stuff that you and the Earth, your lunch, Sheffield, Jupiter and so forth are made from, only forms one part in 25 of the stuff that makes up the Universe. The other 95% is comprised of ‘Dark Matter’, invisible save for its gravitational effects and whose makeup remains a complete mystery (it is hoped that the LHC may give some insights here). Finally, if that were not enough, there is Dark Energy, the discovery of which won a Nobel last year, an even more mysterious (and rather sinister) force that appears to be ripping the Universe apart. No one has a clue what that is either. 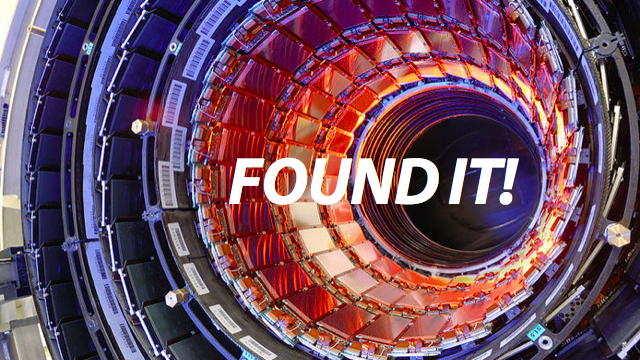 In short, finding the Higgs is a triumph. Nobels all round. Physics is ‘safe’, at least from being found to be completely wrong. But we still don’t really know what the Universe is, where it came from, or how it came into being, whether it is the only one and we do not known the really fundamental nature of its main components.Time is a mystery, and the fate of the Cosmos remains uncertain to say the least. The list of things we do not know is still vastly longer than the list of things we do know. No, we do not know the mind of God, and possibly never will. Edited by Magnus, 04 July 2012 - 04:05 AM. What are the implications for this discovery? Why is this discovery so much important? 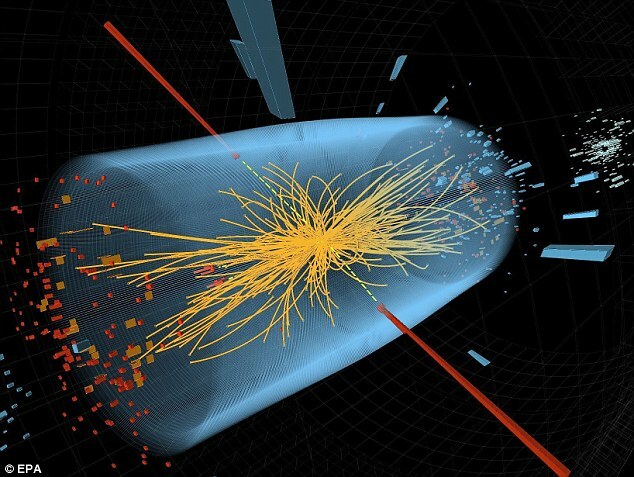 The hunt for the Higgs boson - the ‘God particle’ that holds the universe together - is over. Scientists at Switzerland's CERN (the European Council for Nuclear Research) announced the discovery of the particle to an audience including Professor Peter Higgs, who first suggested the existence of the particle four decades ago. The discovery is the biggest leap in physics for decades - filling in a crucial gap in our understanding of the atom. In the long term, the discovery could lead to new technologies. Professor Higgs, who first postulated the particle nearly 50 years ago, was at the announcement. 'This is indeed a new particle,' said lab spokesman Joe Incandela. 'This is something that may in the end be one of the biggest discoveries or observations of any new phenomena that we’ve had in our field in the last 30 or 40 years,' said lab spokesman Joe Incandela. The discovery fills in the last gap in the 'standard model' of physics - proving Einstein right, and possibly leading to new technologies built on our understanding of the particle. In December last year scientists at the Large Hadron Collider (LHC) - the ‘Big Bang’ particle accelerator which recreates conditions a billionth of a second after the birth of the universe - revealed they had caught a first tantalising glimpse of the Higgs. Since then they have sifted through vast quantities of data from innumerable high energy collisions in an effort to reduce the odds of being wrong. A statistical standard of proof known as ‘five sigma’ is the ultimate confirmation of a discovery. ‘The results are preliminary but the 5 sigma signal at around 125 GeV we’re seeing is dramatic. This is indeed a new particle. We know it must be a boson and it’s the heaviest boson ever found,’ said CMS experiment spokesperson Joe Incandela. Prof Higgs, who first postulated the theory more than 40 years ago, told the BBC: 'I'm rather surprised that it happened in my lifetime - I certainly had no idea it would happen in my lifetime at the beginning, more than 40 years ago, because at the beginning people had no idea about where to look for it, so it's really amazing for me to find out that it's really enough... for a discovery claim. At the LHC, scientists shoot two beams of protons - the ‘hearts’ of atoms - at each other round 27 kilometres of circular tunnels at almost the speed of light. When the protons smash together the enormous energies involved cause them to decay into an array of more fundamental particles. These may then decay further into yet more particles. Physicists needed the Higgs to plug a gaping hole in the ‘Standard Model’, the theory that explains all the particles, forces and interactions making up the universe. So far nothing has been observed to account for mass, and the fact that some particles weigh more than others. According to the theory, the Higgs boson is the emissary of an all-pervading ‘Higgs field’ that gives matter mass. The more particles interact with the field, the more massive they become and the heavier they are. A Standard Model universe without the Higgs boson could not exist. Everything would behave as light does, floating freely and not combining with anything else. There would be no atoms, made from conglomerations of protons, neutrons and electrons, no ordinary matter, and no us. 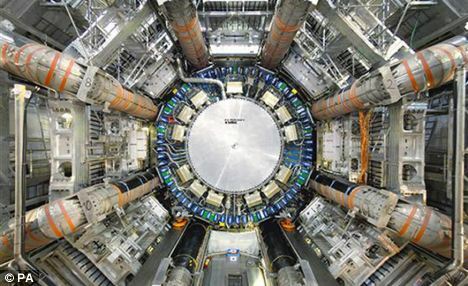 British experts queued to heap praise on the discovery of a new sub-atomic particle bearing the hallmarks of the Higgs boson. Professor Valentin Khoze, director of Durham University's Institute for Particle Physics Phenomenology (IPPP), said: 'The mounting evidence that Higgs bosons have been produced and detected at the Large Hadron Collider experiment at Cern is a triumph for particle physics. 'Without the Higgs particle, other particles, such as electrons and quarks, would be massless and the Universe would not be what it is. 'Now, with the amazing results from the LHC, we are finally finding growing experimental evidence that the Higgs really exists. Professor Jordan Nash, head of high energy physics at Imperial College London, said: 'This is a fantastic result. Professor Jerome Gauntlett, head of theoretical physics at Imperial College London, said: 'The discovery of the Higgs boson is a truly great moment for science. 'It is fantastic moment for British science that 50 years later on we have received such dramatic confirmation of their profound ideas. Like all great discoveries, more detailed studies of the Higgs are likely to have a huge impact on future fundamental scientific inquiry. Professor Paul Dauncey, Professor of Particle Physics at Imperial College London said: 'This is a major breakthrough for our understanding of the Universe. 'If this new particle is what we think it is, then it is a completely new type of particle never seen before. We can think of it as the final piece of the puzzle, completing what is considered to be the 'standard' theory. Professor Sir Timothy O'Shea, Principal of the University of Edinburgh, said: 'We are delighted at this significant development in the search for the Higgs boson, and congratulate Professor Peter Higgs on this. 'This particle is integral to our understanding of the physical world and evidence of its existence is a testament to Professor Higgs and to all the scientists who are working to uncover it. Prof Stefan Soldner-Rembold, Professor of Particle Physics at the University of Manchester, said: 'Today we have witnessed a discovery which gives unique insight into our understanding of the universe and the origin of the masses of fundamental particles. Professor Dave Charlton, deputy spokesperson for the Atlas experiment at the University of Birmingham's School of Physics and Astronomy, said: 'Many people have been working night and day to analyse the fresh data from the LHC which has been pouring in this year, which has allowed us to reveal these exciting preliminary results today. 'The tantalising hints we saw in December are repeated and strengthened in the new Atlas data, so we're now quite confident that we're seeing a new particle. Prof Themis Bowcock, head of particle physics at the University of Liverpool, who has worked on the LHC, said: 'This is cast-iron proof that a new particle has been discovered. It looks like the Higgs. 'For physicists the dice are definitely now loaded in favour of a discovery. Based on the Cern results alone there appears to be less than one chance in a million that this is fake, which is roughly the same probability as flipping a coin heads-up 21 times in a row. Very few physicists would privately argue that this is not a Higgs particle. 'Half a century after it was first proposed, and after a monumental effort by generations of physicists around the world, the discovery of the Higgs represents a major breakthrough in our fundamental understanding of nature. Edited by Magnus, 04 July 2012 - 06:28 AM. I am so excited .... this IS AMAZING DISCOVERY!!! THIS IS HUGE!!! A HOLOGRAPHIC UNIVERSE !! And we are nothing MORE THAN COMPUTER PROGRAMS !! This concept of Holographic Universe has been around for decades mainly made popular by the UFOlogists !! Now who is laughing?? Any chance you could merge this thread with this one magnus? Newfound particle may be at the core of existence. "I think we have it. You agree?" Speaking to a packed audience Wednesday morning in Geneva, CERN director general Rolf Heuer confirmed that two separate teams working at the Large Hadron Collider (LHC) are more than 99 percent certain they've discovered the Higgs boson, aka the God particle—or at the least a brand-new particle exactly where they expected the Higgs to be. The long-sought particle may complete the standard model of physics by explaining why objects in our universe have mass—and in so doing, why galaxies, planets, and even humans have any right to exist. "We have a discovery," Heuer said at the seminar. "We have observed a new particle consistent with a Higgs boson." At the meeting were four theorists who helped develop the Higgs theory in the 1960s, including Peter Higgs himself, who could be seen wiping away tears as the announcement was made. Although preliminary, the results show a so-called five-sigma of significance, which means that there is only a one in a million chance that the Higgs-like signal the teams observed is a statistical fluke. "It's a tremendous and exciting time," said physicist Michael Tuts, who works with the ATLAS (A Toroidal LHC Apparatus) Experiment, one of the two Higgs-seeking LHC projects. The Columbia University physicist had organized a wee-hours gathering of physicists and students in the U.S. to watch the announcement, which took place at 9 a.m., Geneva time. "This is the payoff. This is what you do it for." The two LHC teams searching for the Higgs—the other being the CMS (Compact Muon Solenoid) project—did so independently. Neither one knew what the other would present this morning. "It was interesting that the competing experiment essentially had the same result," said physicist Ryszard Stroynowski, an ATLAS team member based at Southern Methodist University in Dallas. "It provides additional confirmation." CERN head Heuer called today's announcement a "historic milestone" but cautioned that much work lies ahead as physicists attempt to confirm the newfound particle's identity and further probe its properties. For example, though the teams are certain the new particle has the proper mass for the predicted Higgs boson, they still need to determine whether it behaves as the God particle is thought to behave—and therefore what its role in the creation and maintenance of the universe is. "I think we can all be proud ... but it's a beginning," Heuer said. The five-sigma results from both the ATLAS and CMS experiments exceeded the expectations of many physicists, including David Evans, leader of the U.K. team that works on the LHC-based ALICE (A Large Ion Collider Experiment) Collaboration. Evans had predicted Tuesday the teams would announce a four-sigma result—just short of the rigorous standard traditionally required for a new-particle observation to officially count as a true discovery and not a fluke. "It's even better than I expected," said Evans, of the University of Birmingham in the U.K. "I think we can say the Higgs is here. It exists." Evans attributed the stronger-than-expected results to "a mixture of the LHC doing a fantastic job" and "ATLAS and CMS doing a fantastic job of improving their analysis since December," when the two teams announced a two-sigma observation of signs of a Higgs-like particle. "So even with the same data, they can get more significance." "The LHC and experiments have been doing miracles. I think we are working beyond design," the Italian particle physicist added. ALICE's Evans said he was extremely pleased by the Higgs results but admitted feeling just a bit disappointed that the results weren't more surprising. "Secretly I would have loved it to be something slightly different than the standard model predictions, because that would indicate that there's something more out there." On God-Particle Hunt, It's "Easy to Fool Yourself"
Wednesday's announcement builds on results from last December, when the ATLAS and CMS teams said their data suggested that the Higgs boson has a mass of about 125 gigaelectron volts (GeV)—about 125 times the mass of a proton, a positively charged particle in an atom's nucleus. "For the first time there was a case where we expected to [rule out] the Higgs, and we weren't able to do so," said Tim Barklow, an experimental physicist with the ATLAS Experiment who's based at Stanford University's SLAC National Accelerator Laboratory. A two-sigma finding translates to about a 95 percent chance that results are not due to a statistical fluke. While that might seem impressive, it falls short of the stringent five-sigma level that high-energy physicists traditionally require for an official discovery. Five sigma means there's a less than one in a million probability that a finding is due to chance. "We make these rules and impose them on ourselves because, when you are exploring on the frontier, it is easy to fool yourself," said Michael Peskin, a theoretical physicist also at SLAC. Higgs Holds It All Together? The Higgs boson is one of the final puzzle pieces required for a complete understanding of the standard model of physics—the so-far successful theory that explains how fundamental particles interact with the elementary forces of nature. The so-called God particle was proposed in the 1960s by Peter Higgs to explain why some particles, such as quarks—building blocks of protons, among other things—and electrons have mass, while others, such as the light-carrying photon particle, do not. Higgs's idea was that the universe is bathed in an invisible field similar to a magnetic field. Every particle feels this field—now known as the Higgs field—but to varying degrees. If a particle can move through this field with little or no interaction, there will be no drag, and that particle will have little or no mass. Alternatively, if a particle interacts significantly with the Higgs field, it will have a higher mass. The idea of the Higgs field requires the acceptance of a related particle: the Higgs boson. According to the standard model, if the Higgs field didn't exist, the universe would be a very different place, said SLAC's Peskin, who isn't involved in the LHC experiments. "It would be very difficult to form atoms," Peskin said. "So our orderly world, where matter is made of atoms, and electrons form chemical bonds—we wouldn't have that if we did not have the Higgs field." In other words: no galaxies, no stars, no planets, no life on Earth. Buried beneath the French-Swiss border, the Large Hadron Collider is essentially a 17-mile-long (27-kilometer-long) oval tunnel. Inside, counter-rotating beams of protons are boosted to nearly the speed of light using an electric field before being magnetically steered into collisions. Exotic fundamental particles—some of which likely haven't existed since the early moments after the big bang—are created in the high-energy crashes. But the odd particles hang around for only fractions of a second before decaying into other particles. Now that the Higgs boson—or something like it—has been confirmed to indeed have a mass of around 125 to 126 GeV, scientists have a better idea why the God particle has avoided detection for so long. This mass is just high enough to be out of reach of earlier, lower-energy particle accelerators, such as the LHC's predecessor, the Large Electron-Positron Collider, which could probe to only about 115 GeV. At the same time 125 GeV is not so massive that it produces decay products so unusual that their detection would be clear proof of the Higgs's existence. In reality the Higgs appears to transform into relatively commonplace decay products such as quarks, which are produced by the millions at the LHC. "It just so happens that nature is really nasty to us, and the range that we've narrowed [the Higgs] down to is the range that makes it most difficult to find," ALICE's Evans said. Despite the challenges, ATLAS's Gianotti said, it's fortunate that the Higgs has the mass that it does. "It's very nice for the standard-model Higgs boson to be at that mass," she said. "Because at that mass we can measure it at the LHC in a huge number of final states. So, thanks Nature." While the search for the Higgs was a primary motivation for the construction of the LHC, activity at the world's largest atom smasher won't stop if the Higgs boson is confirmed. For one thing, the two teams will be busy preparing the data they presented today for submission to scientific journals for publication. There are also lingering questions that will require years of follow-up work, such as what the God particle's "decay channels" are—that is, what particles the Higgs transforms into as it sheds energy. The answer to that question will allow physicists to determine whether the particle they have discovered is the one predicted from theory or something more exotic, Columbia University's Tuts said. "Does it really smell and taste like a Higgs? Is it being produced at the rate that a standard model Higgs would predict? That's the work that's going to go on over the course of this year at least," he added. Something the public often forgets, too, is that ATLAS and CMS make up only two of the LHC's four major experiments, Evans said. The other two—the LHCb Collaboration and Evan's own ALICE—are investigating other physics arcana, such as why the universe contains so little antimatter. "If you want to compare it to the Olympics, finding the Higgs would be like winning just one gold medal," Evans said. "I'm sure most countries would like to win more than one gold medal. And I think CERN is going to deliver a lot more gold medals over the years." Pakistani Scientists at CERN Help Find "God Particle"
One of the most important discoveries in Physics since Einstein's Theory of Relativity has possibly just been made at CERN and dozens of Pakistani scientists have contributed to it. Scientists at CERN claim that they have discovered the Higgs field, also nicknamed the "God particle" that travels faster than light, thereby proving Einstein wrong, according to the Associated Press reports. "The feeling that most people have is this can't be right, this can't be real," the AP story quotes James Gillies, a spokesman for the European Organization for Nuclear Research. The most high-profile effort to find "God Particle" is taking place about 300 ft below ground in a tunnel at the French-Swiss border. Buried there is a massive particle accelerator and super collider called LHC (Large Hadron Collider) run by the Swiss lab CERN (European Organization of Nuclear Research), which has two beams of particles racing at nearly the speed of light in opposite directions and the resulting particles produced from collisions are being detected by massive detectors in the hope of experimentally finding the fundamental particle of which everything in the universe is built from: God Particle. ” When I first came to CERN, I was mainly working on technical things but became increasingly involved in political issues. In 1999, I went back to Pakistan to set up a group working on different aspects of the LHC project. There I had to convince my people and my government to collaborate with CERN, which was rather difficult, since nobody associated science with Switzerland. It is known as a place for tourism, for its watches, and nice places to visit. In addition to the 27 scientists, Pakistan has made material contributions to the tune of $10m. 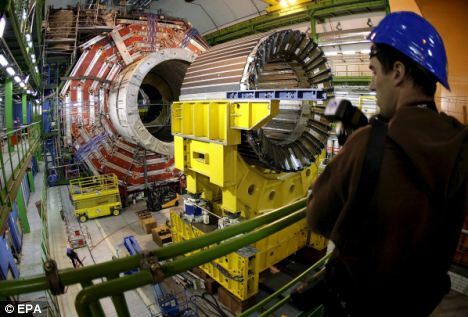 Pakistan signed an agreement with CERN which doubled the Pakistani contribution from one to two million Swiss francs. And with this new agreement Pakistan started construction of the resistive plate chambers required for the CMS muon system. While more recently, a protocol has been signed enhancing Pakistan’s total contribution to the LHC program to $10 million. CERN is a pan-European effort and all of its member states are European. Pakistan, with all of its contributions to LHC project, is hoping to join the ranks of India, Israel, Japan, Russia, Turkey and the United States as anobserver state at CERN. 10. Assembly of CF (Carbon Fiber) Fins for the Silicon Tracker’s TOB (Tracker Outer Barrel). 11. 245 of the 300 CMS chambers required were made in Islamabad. The Higgs boson, also known as "God Particle", is a hypothetical massive scalar elementary particle predicted to exist by the Standard Model of particle physics. It is the only Standard Model particle not yet experimentally observed. An experimental observation of it would help to explain how otherwise massless elementary particles cause matter to have mass. More specifically, the Higgs boson would explain the difference between the massless photon and the relatively massive W and Z bosons. Elementary particle masses, and the differences between electromagnetism (caused by the photon) and the weak force (caused by the W and Z bosons), are critical to many aspects of the structure of microscopic (and hence macroscopic) matter; thus, if it exists, the Higgs boson is an integral and pervasive component of the material world. The Standard Model of particle physics has its limits. It can't explain several big mysteries about the universe that have their roots in the minuscule world of particles and forces. If there's one truly extraordinary concept to emerge from the past century of inquiry, it's that the cosmos we see was once smaller than an atom. This is why particle physicists talk about cosmology and cosmologists talk about particle physics: Our existence, our entire universe, emerged from things that happened at the smallest imaginable scale. The big bang theory tells us that the known universe once had no dimensions at all—no up or down, no left or right, no passage of time, and laws of physics beyond our vision. There have been many other efforts to build particle accelerators and super colliders including SLAC (Stanford Linear Accelerator) and Fermi Collider, but none so ambitious and massive as the LHC. This discovery, if indeed confirmed, will advance human knowledge dramatically and eventually help treat diseases, improve the Internet, and open doors to travel through extra dimensions, according to the scientists associated with it. Here's a short summary for the importance behind detecting the Higgs boson. It's expected to be announced on July 4th. The Higgs boson is the smallest detectable wave in the Higgs field. Interacting with the Higgs field causes particles to acquire mass; without the Higgs field, no particle would have mass. Some particles don't feel the Higgs field at all (photons) and so are massless; some feel it very lightly (neutrinos) and have little mass; ordinary particles feel it strongly. In physics the current best understanding of the forces (excluding gravity) is called the Standard Model. The one remaining elementary particle in the Standard Model that hasn't been experimentally detected is - the Higgs boson. Electromagnetism is the unification of electricity and magnetism, which were originally thought to be two different forces. Electroweak unification - electromagnetism and weak force unified into the "electroweak" force. The Higgs field explains why these two forces normally appear to be different. The discovery of the Higgs boson could be considered final verification for electroweak unification. Grand unified theory - electroweak and strong force unified into the grand" force. Theory of everything - grand force and gravity unified. This is the ultimate purpose behind areas of research such as string theory. Edited by Magnus, 05 July 2012 - 01:02 PM. A truly REMARKABLE discovery !! I am so proud of Scientists WHO ARE LIKE FREEDOOM FIGHTERS and who keep posting the truth againt the lies and deception of some powerful, corrupt institutions which have existed for centuries. Science is the Ultimate truth and with time it is will unmask all the lies. ^^ And who do you think is the creator of Science? Bro, science does indeed explain things, but nothing can explain Allah Subhanaho Wata'aalah, other than the Qur'aan and Hadeeth. I welcome the science discoveries and read them with interest. The physics of the world around us is indeed to be explored, but when such instances transcend into views that Allah Subahanaho Wata'aalah doesn't exist, is where I part with such views. Higgs Boson particle can also show parallel universes, these particle have frequency IF we can change (in future) we can see different universe or reality. The discovery of the long-elusive Higgs boson particle Wednesday might bring clarity on the existence of the objects in the universe. But the sub atomic particle itself must be wondering where it came from. Who discovered it? Peter Higgs, Satyendra Nath Bose or Abdus Salam? You might be aware of the first two, but the new entry in the list comes from none other than India’s neighbor Pakistan, which has claimed their scientist contributed to the landmark discovery. It said that the earliest work on the “standard model” – one of the most successful theories in physics, which describes how matter is built and how particles interact – was conducted by Mr. Salam. “Of the many discoveries that later solidified the Standard Model of physics was work done in 1967 by Dr. Abdus Salam and American physicist Steven Weinberg in unifying the Higgs mechanism to Glashow’s theory, giving the ‘electroweak theory’ its current form,” the paper said. And much like the Indian government and the media, which had been annoyed over the lack of credit given to Mr. Bose in the Higgs boson drama, the Pakistani newspaper, too, shares a disappointment. But the most important thing that everyone keepings deliberately overlooking is the fact that this discovery has proven that the UNIVERSE IS A HOLOGRAM !! Now just imagine this - you have a computer with a program running from its hard disk. The computer is connected to a projector capable of projecting 3D holograms or a 3D movie on a screen. In other words this whole Universe along wih us may just be a program running on someone's computer !!! This is a frightening possibility which just cannot be overlooked any more. Truth will disappoint a lot of us. ^ How ? The article clearly states the Hologram theory is a possibility just like the string theory/multi verse theory. On another note , Keep in mind, although they have found it and it is amazing, they are still waiting to see how the particle decays. There were some deviations from the standard way that the particle should decay, so there is a chance it could be something else. Nevertheless, its 99.9999 percent sure that its the Higgs boson. Next we wait for dark matter/energy ? Those are just media gimmicks or marketable titles for books, for example god particle or other dimensions etc. pay no attention to them, only fantasies for the unhinged. This is not the end of it. The big bang theory states that matter and antimatter collision created a big bang. Billions of centuries later only matter remains in the universe, and no sign of antimatter. Hence in order to understand antimatter one needs to know about matter. After the big-bang massless particles came together due to Higgs mechanism and created matter. The only obstacle was finding the higgs boson which would validate the higgs mechanism. The scientist that came up with a mathematical model of the higgs boson postulated that it should have a mass or energy of about 80 GeV, latest findings show an energy of 126 GeV after the proton particles are smashed higgs boson is created which decays in to smaller and smaller particles adding them together they get the final number 126 GeV. But one might think what is the purpose for all of this. Once they have a perfect standard model then they could theorise the complete opposite of that to look for antimatter. That is the end game (for CERN anyway). Its suffice to say that they have probably found the higgs boson (even after making a mistake that neutrinos travel faster then light! ), but they have been smashing proton beams. And proton is not exactly an elementary or fundamental particle, it is a hadron a composite particle with many other particles with it. And after the proton beams collide it creates a lot of other particles in LHC which makes detecting the Higgs boson very hard, or even when they do find what they are looking for they are still not sure. The scientists now think the next step should be to collide electrons and positrons. But the LHC is not big enough. Because electrons are even smaller then protons and require to travel a lot longer to pick up mass. And that’s where the danger lies of creating black holes or of matter antimatter collisions and such. However I’ve read that positrons are very theory based particles and have been observed here and there in labs nothing more and it might take many billions to make another even bigger LHC. Suffice to say I probably read something the scientist spewed out from their backsides. My own prediction is that the reason why scientist went for proton beams is because understanding the proton would give them a perfect standard model to also look for the antiprotons, which they could harness to create anithydrogen atoms, since hydrogen is the lightest of all elements harvesting antimatter should be less complex. Antiprotons have been detected in cosmic rays for many years. And CERN has also produced some antimatter or antihydrogen atoms for very short periods of time. Obviously they aren’t going to come out an tell the public their motives are to seek a unlimited supply of an energy source, there has to be a far more grandiose moral traction to this whole saga the one the whole world could relate to! The search is for antimatter and this is the beginning. I am starting to ENJOY THIS DESPERATION on parts of so called believers in Theory of Creation!! One by one, with each passing day, with each passing year their castles of lies are slowly crumbling. That day is not far when these Castles of Lies will fall once and for all!!! Even if I am not alive to see that day there will be others rejoicing this TRULY UNIQUE AND HISTORIC EVENT .... FINALLY free from chains of deception and lies once and for all eternity to come !! Thank you to all the SCIENTISTS for bringing us closer to the truth !! Let's examine what has happened during scientific discovery and relate it to mathematics. We know for example that the earth was created from the big bang theory. This theory is explained in the Quran if you want the reference I will get it for you. Then the question comes who put the gases there. Then who created the thing that put the gases there and the questions go on and on. Imagine time and space as a 2D cone with the open end being the present. If you continue to extend the open end it (time and space) gets bigger. In the Quran it says we created the heavens and we are continually expanding them. Until recently we thought the universe was contracting and was eventually going to implode. Once again the quran was correct. Now go back in time or the other end of the cone and continue an infinite time unti you reach the point of the cone where all matter stops to exit. Now you being of a scientific mind and background will agree that to start any chemical reaction and that's what creation is a chemical reaction you need a catalyst. Something to initiate a reaction. So tell me at infinite point using the principles of infinite time who or what if not God started the creation. When I understood this at A level maths I never doubted the existence of God. Simple isn't it. Too simple but arnt most things? Science will surely open curtains of creation and that's all. ISLAMABAD (AP) — The pioneering work of Abdus Salam, Pakistan's only Nobel laureate, helped lead to the apparent discovery of the subatomic "God particle" last week. But the late physicist is no hero at home, where his name has been stricken from school textbooks. Praise within Pakistan for Salam, who also guided the early stages of the country's nuclear program, faded decades ago as Muslim fundamentalists gained power. He belonged to the Ahmadi sect, which has been persecuted by the government and targeted by Taliban militants who view its members as heretics. Their plight — along with that of Pakistan's other religious minorities, such as Shiite Muslims, Christians and Hindus — has deepened in recent years as hardline interpretations of Islam have gained ground and militants have stepped up attacks against groups they oppose. Most Pakistanis are Sunni Muslims. Salam, a child prodigy born in 1926 in what was to become Pakistan after the partition of British-controlled India, won more than a dozen international prizes and honors. In 1979, he was co-winner of the Nobel Prize for his work on the so-called Standard Model of particle physics, which theorizes how fundamental forces govern the overall dynamics of the universe. He died in 1996. Salam and Steven Weinberg, with whom he shared the Nobel Prize, independently predicted the existence of a subatomic particle now called the Higgs boson, named after a British physicist who theorized that it endowed other particles with mass, said Pervez Hoodbhoy, a Pakistani physicist who once worked with Salam. It is also known as the "God particle" because its existence is vitally important toward understanding the early evolution of the universe. Physicists in Switzerland stoked worldwide excitement Wednesday when they announced they have all but proven the particle's existence. This was done using the world's largest atom smasher at the European Organization for Nuclear Research, or CERN, near Geneva. "This would be a great vindication of Salam's work and the Standard Model as a whole," said Khurshid Hasanain, chairman of the physics department at Quaid-i-Azam University in Islamabad. In the 1960s and early 1970s, Salam wielded significant influence in Pakistan as the chief scientific adviser to the president, helping to set up the country's space agency and institute for nuclear science and technology. Salam also assisted in the early stages of Pakistan's effort to build a nuclear bomb, which it eventually tested in 1998. Salam's life, along with the fate of the 3 million other Ahmadis in Pakistan, drastically changed in 1974 when parliament amended the constitution to declare that members of the sect were not considered Muslims under Pakistani law. Ahmadis believe their spiritual leader, Hadrat Mirza Ghulam Ahmad, who died in 1908, was a prophet of God — a position rejected by the government in response to a mass movement led by Pakistan's major Islamic parties. Islam considers Muhammad the last prophet and those who subsequently declared themselves prophets as heretics. All Pakistani passport applicants must sign a section saying the Ahmadi faith's founder was an "impostor" and his followers are "non-Muslims." Ahmadis are prevented by law in Pakistan from "posing as Muslims," declaring their faith publicly, calling their places of worship mosques or performing the Muslim call to prayer. They can be punished with prison and even death. Salam resigned from his government post in protest following the 1974 constitutional amendment and eventually moved to Europe to pursue his work. In Italy, he created a center for theoretical physics to help physicists from the developing world. Although Pakistan's then-president, Gen. Zia ul-Haq, presented Salam with Pakistan's highest civilian honor after he won the Nobel Prize, the general response in the country was muted. The physicist was celebrated more enthusiastically by other nations, including Pakistan's archenemy, India. Despite his achievements, Salam's name appears in few textbooks and is rarely mentioned by Pakistani leaders or the media. By contrast, fellow Pakistani physicist A.Q. Khan, who played a key role in developing the country's nuclear bomb and later confessed to spreading nuclear technology to Iran, North Korea and Libya, is considered a national hero. Khan is a Muslim. Officials at Quaid-i-Azam University had to cancel plans for Salam to lecture about his Nobel-winning theory when Islamist student activists threatened to break the physicist's legs, said his colleague Hoodbhoy. "The way he has been treated is such a tragedy," said Hoodbhoy. "He went from someone who was revered in Pakistan, a national celebrity, to someone who could not set foot in Pakistan. If he came, he would be insulted and could be hurt or even killed." The president who honored Salam would later go on to intensify persecution of Ahmadis, for whom life in Pakistan has grown even more precarious. Taliban militants attacked two mosques packed with Ahmadis in Lahore in 2010, killing at least 80 people. "Many Ahmadis have received letters from fundamentalists since the 2010 attacks threatening to target them again, and the government isn't doing anything," said Qamar Suleiman, a spokesman for the Ahmadi community. For Salam, not even death saved him from being targeted. Hoodbhoy said his body was returned to Pakistan in 1996 after he died in Oxford, England, and was buried under a gravestone that read "First Muslim Nobel Laureate." A local magistrate ordered that the word "Muslim" be erased. If only he wasn't a qadiyani-kafir, he would be respected throughout Pakistan. If he were a Christian-Pakistani, Shia-Pakistani, Sunni-Pakistani, Sikh-Pakistani or even a Hindu-Pakistani, he would've been respected in Pakistan by all Pakistanis. However, he belongs to a group, whose belief invokes the wrath of all Muslims around the world, be they Pakistani or not. Whats worse than a Kafir .... it's a Munafiq and whats worse than a Munafiq ..... its a qadiyani. They keep talking about possible new technologies to be developed from this discovery. What new technologies exactly? 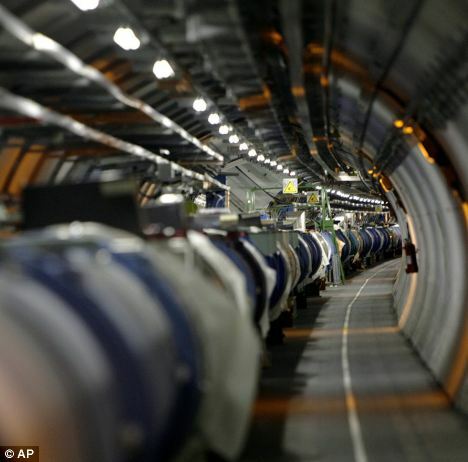 As far as I understand it, this Large Hadron Collider is some kind of an atomic test. It'll probably lead to bigger and more powerful nuclear weapons and also much more bigger and powerful nuclear reactors. Also in regards to the previous post, Abdus Salam was a Qadiani??? ^^ Yes, not only we Pakistanis have battle it out with TTP, BLA, US-NATO & hindustan. Oust corrupt zardari-ppp and other corrupt politicians. Plus unite ourselves as nation ...... but also the infestation of qadiyani-kafirs in Pakistan.